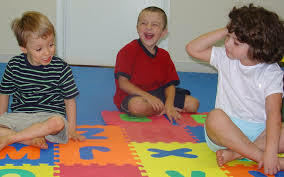 Here are some activities that can supplement a child’s speech or language therapy program. Stuttering: A child experiences a break or disfluency in their speech, manifested as repetitions of words, syllables or prolonged sounds. Activity: During conversation, resist completing your child’s phrases or words. Be patient and let them work through a sentence or thought. Then, rather than correct any “broken” words, repeat back to your child what was said. This shows them that you are listening carefully and provides a relaxed and correct model of the words. Frontal lisps: The most common form of a lisp. In this type, a child pronounces an “s” sound more like a “th” than an “s”. Activity: Games that give you an opportunity to model the “s” sound and your child to practice it back. Play Bingo using words that start with “s”. Or use the card game Go Fish with words with “s” sounds instead of numbers. Also, check out Superduper publications for books and games that work on articulation and phonological skills. Auditory processing or receptive language deficit: A child has trouble processing a conversation or understanding what has just been said. Activity: Promote situations where your child must listen and follow directions in order to get a reward. A good option is the game Twister, which requires your child to listen to directions and then translate them into an action. Leave us your comments. Your feedback is greatly appreciated. Let us know what other topics you would like to have discussed. Share this post with your friends. Remember to always praise your children.